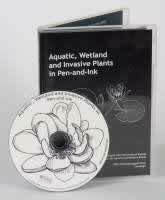 Aquatic, Wetland and Invasive Plants in Pen-and-Ink is a DVD digital collection of botanical drawings depicting 175 common and rare, native and non-native species. These are hi-res TIF scans, ready for use in print and web publications. This DVD set is a valuable resource for aquatics and wetlands managers and regulators, environmental groups, aquatic gardeners, homeowner associations, garden clubs, landscape architects, teacher, students, and many others. The original purchaser of this DVD set may use the drawings at will without further need for copyright royalties or permissions.